What a crazy way to end the regular season! 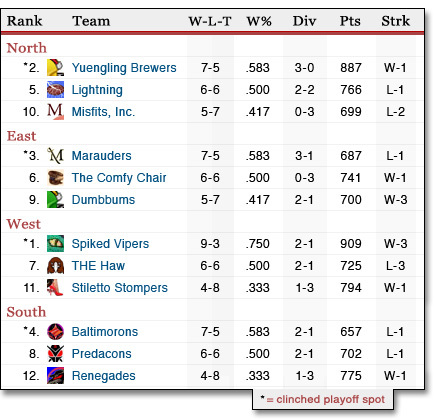 That means this last week will fill HALF of the playoff spots. The two teams currently on the outside looking in are out if they lose (or tie) and still need some luck even if they win. A Dumbbums win means a Comfy Chair loss, but the 'Bums would have to win by more than 41 points to leapfrog the Chair in the standings. While that's not unheard of in the 3FL, the easiest path for both teams is a Predacons loss. The Misfits have a much longer shot, but if they can somehow pull out a win against the 2nd place Brewers, it will likely mean they've scored enough points to break a potential tie in their favor.